Core Achieved #1 status in 2012 as the top boutique real estate firm in Manhattan, according to a new study by The Real Deal. After many years of working at a major Manhattan real estate firm, I am proud to be associated with CORE for the last year. The company’s focus on marketing our new development and re-sales properties in new fresh and effective campaigns that outshines any other marketing being created speaks to our growth in stature while remaining the same in size from a broker standpoint. CORE and StreetEasy.com Team Up to create CORE Control! As a real estate agent with CORE, New York’s leading boutique real estate firm, I’m really excited to share that CORE has teamed up with StreetEasy.com to create CORE Control, the first ever listing and client management platform built by a real estate firm in collaboration with StreetEasy. Having been provided the opportunity to beta-test it, CORE Control is an amazing tool for CORE agents and our clients to interact on searches in a whole new way on the site that is rapidly on its way to becoming the most searched real estate site in New York City. As an agent who from the first day I started in 1999 focused on client service and sharing of information, StreetEasy’s entry into the marketplace was a welcome breath of transparency. One of the most comprehensive sites for New York City real estate information, it is searched by clients and brokers alike from all firms. To have the opportunity to be the first to take the Streeteasy experience to the next level for my clients – I’m thrilled! Watch the video (at the top of this post) featuring a conversation between CORE CEO, Shaun Osher and StreetEasy CEO, Michael Smith for more on CORE Control and how it will change the game for our clients. A review of the 2nd Quarter 2011 New York Real Estate Market reports put out by different residential firms including the June 2011 CORE Real Time Report reveals that the 2nd Quarter of 2011 showed a continued improvement in market conditions. Average prices remained stable in the major market segments (1-2Bedrooms) while declining slightly for studios and showing a slight drop in the super-high end. That may in part be due to the one-time sale at the Plaza for a $48 Million apartment which closed in the 1st quarter and would have drawn the average up above normal for that quarter. After two years of recession-era pause, the new development at 305 West 16th Street opened its doors and sales office as the condop, 305W16, last month. During the past two years, many have walked by the imposing facade and wondered, “What’s behind those incognito windows?” But I questioned it. Really? Here? 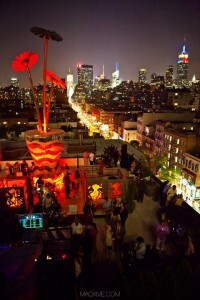 A month ago, I was invited to CORE’s opening party at 305W16 and my relationship with the building changed completely. (Full disclosure – I am a broker with CORE and this is not a PR piece, but something I genuinely wanted to write). I was able to experience the building in a whole new way once I was inside at a fun and exciting event that featured DJs, great food, painted models, a fire breather and a flamenco performance. The views from the roof deck, while only seven stories high, were unexpectedly spectacular. At dusk, the open sight lines from the North and West set the sparkling lights of Chelsea and Midtown alight. In an article written for guardian.co.uk on June 14th, Roy Greenslade reveals that per Comscore, The Huffington Post beat The New York Times as the most viewed news website in the US in May 2011. With 35.6 Million unique visitors vs. the NYTimes.com’s 33.6 Million visitors, the six year old web-site founded by Arianna Huffington has broken a new benchmark. While the NYTimes site saw an 11% drop in visitors after it erected a pay wall in March, limiting visitors to the site to 20 free articles a month, that does not explain the increase of visitors to the Huffington Post by 14%. Acquired by AOL, it has recently benefitted from re-directed traffic to it from AOLNews. I found this article interesting because I think it reveals the changes that have been evolving in all industries over the last ten years, due to the emergence of online business technology and mobile media devices and portals. On-line presence has become not only an adjunct to a business model, but as shown by this example, it is the business model. News Update: Tony Sargent moves to CORE! Dear Clients and Friends and “The Sargent Report” visitors: 2011 has already proven to be successful which is why I write you today. After eleven successful years at Prudential Douglas Elliman, I am thrilled to announce that I recently joined one of Manhattan’s most well-respected and highly acclaimed boutique realty firms, CORE. Each of my clients (you) are unique and important to me and deserve focused attention to help you succeed in the sale or purchase of your home. Your long-term real estate needs and our relationship are paramount, which is why I have built a client-focused, boutique-style business model versus a volume-driven transaction-based business.